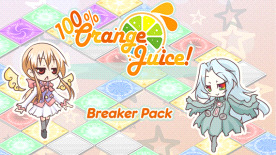 This Extra Character Pack for 100% Orange Juice adds 2 new playable characters from developer Orange_Juice's games - Star Breaker and Sweet Breaker, and a new campaign for both. An all-new campaign for both characters, expanding the lore of the game! The new characters are designed by Orange_Juice's original staff for the game's English Steam release, with character and hyper card art by Hono.